Pidjanga notes: The Pidjanga Blog Poll of 13-19 April 2010 (HERE) almost perfectly predicted the distribution of votes for the mayoralty race. 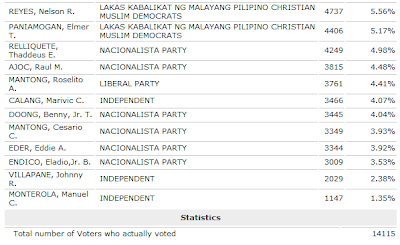 Re-electionists Mayor Mondano received 56% in the Online Poll and in the actual elections, he got 53% or 7,323 votes. Looking at the 2007 statistics where he got only 6,232 (HERE), those who voted for Mayor Mondano actually increased by more than a thousand. Voter's turnout is actually higher by a thousand too. There were around 13,000 voters in 2007 (HERE), and as you can see above, 14,115 Mainitnons went out to cast their votes in 2010. The poll also predicted well that to win a councilor's post, aim at least 5,000 votes. However, the poll's topnotcher Mano Nelson Reyes did not make it to the magic 8 (he placed only 9th! ), instead 10th placer Michael Mozar topped the actual elections. 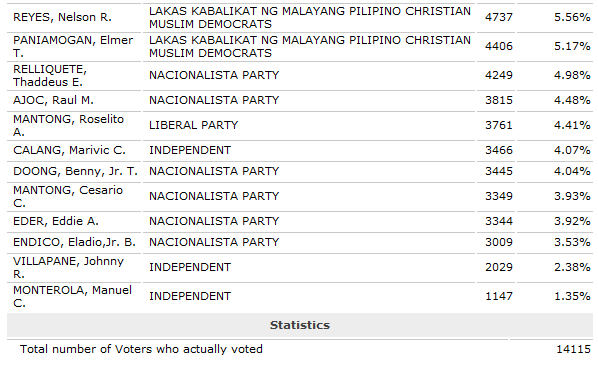 Of those predicted to win, only Thaddeus Reliquette and Nelson Reyes failed to win. They were replace by Anthony Urquia and Fely Odtojan.